When I talk to people about traveling the Lewis & Clark trail, they often seem to imagine there is an actual walking trail carved across the land from St. Louis to Astoria, similar to the incredible footpath created by volunteers over the decades for the Appalachian Trail. But in fact, in many cases it is difficult to get close to the Missouri or the Columbia by car or even on foot unless you are a first-rate hiker, making spots where you can literally walk in the footsteps of Meriwether Lewis and William Clark relatively rare. However, one of the most visually dramatic and historically significant portions of the trails is accessible to just about everyone, thanks to a creative partnership begun in 1989 between local and state government and volunteer groups in Great Falls, Montana. 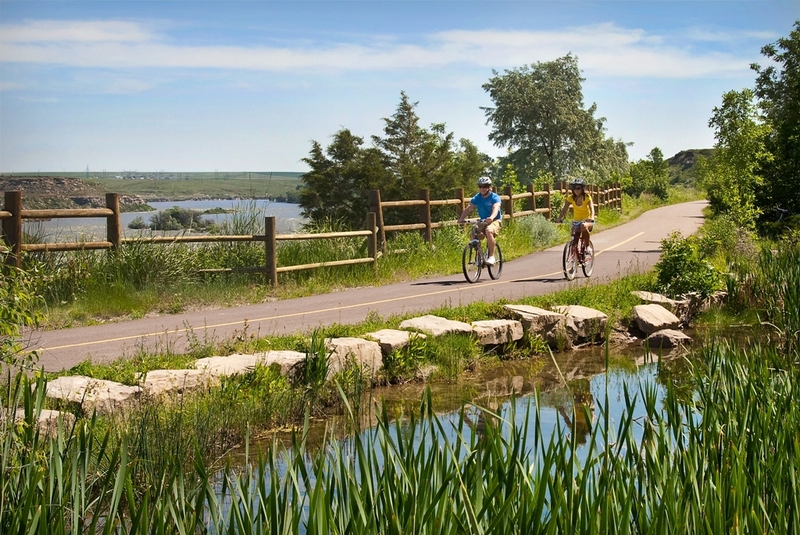 The River’s Edge Trail is a work-in-progress that now encompasses 25 miles of graded path — much of it wheelchair accessible — that lets you hike, bike, skate, or otherwise navigate almost the exact route of the Corps of Discovery. During our most recent visit to Great Falls, we stayed at a hotel (La Quinta) that was right along the Missouri River and the River’s Edge Trail. It was wonderful to be able to walk to nearby eateries and then stroll along the river watching the long, slow Montana sunset sparkle on the water. There were many benches just for sitting and people-watching and the grass was so soft and thick you could take off your shoes and rest your feet in its coolness — a far cry from the prickly pear that tormented Lewis and Clark and their men. The River’s Edge Trail. Courtesy Great Falls Convention and Visitors Bureau. And a far cry from the recent past as well. The powerful waterfalls that forced the epic portage were also irresistible targets for the development of hydroelectric power as far back as the 1890s, when the first dam was built at Black Eagle Falls. 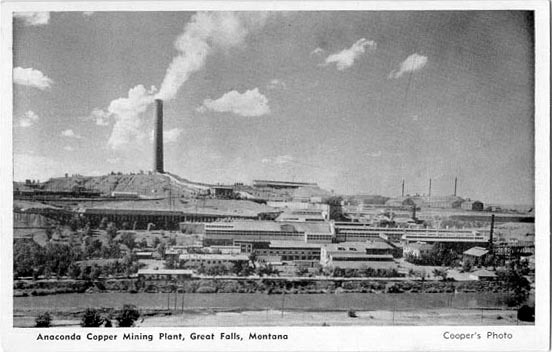 By the turn of the 20th century, Great Falls was a center for the smelting and refining of the copper, gold, and silver being stripped out of Montana’s mines. All five of the falls of the Missouri were dammed and turned to power generation, and major railroads, including the Great Northern and the Chicago, Milwaukee, and St. Paul, moved the materials out to fuel the great industrial factories of the east. Anaconda Copper built the world’s largest smokestack in Great Falls (508 feet) and for decades was the city’s largest employer. Many books have been written on the violent and dramatic history of Montana mining, and many news reports generated on the epic environmental damage at both the mines and the smelters, many of which are now federal “Superfund” sites in need of painstaking cleanup. The Anaconda plant was closed in 1980 and the “Big Stack” demolished two years later. The railroad tracks would have returned to the land if not for the foresight of local leaders who conceived of the old railroad right-of-way as an asset. In the last 20 years, the riverfront has been extensively cleaned up and a trail constructed that includes 13 trailheads, tunnels, bridges, and overpasses (many of which make use of fascinating old historic railroad structures), historic hiking spurs to Lewis & Clark sites, a maze of technical challenges for mountain bikers — even a dog park. I now thought that if a skillfull painter had been asked to make a beautifull cascade that he would most probably have presented the precise image of this one; nor could I for some time determine on which of those two great cataracts to bestoe the palm, on this or that which I had discovered yesterday; at length I determined between these two great rivals for glory that this was pleasingly beautifull,while the other was sublimely grand.